Wholesale Supplier of a wide range of products which include ultrasonic pest repeller -3d stereo wave, ultrasonic pest repeller, ultrasonic pest repellent, attack wave rat repellent, duo pro rodent repellent and standard model - ultrasonic rat repeller. ULTRASONIC PEST REPELLER (COMBOSONIC 3D STEREO WAVE) is a unique and innovative Sonic and Ultrasonic Rodent & Insect Repellent. It combines a 180°vertical wave emission speaker to increase the sound pressure level and 260°dual horizontal wave emission speakers for widespread sound wave projection. The innovative design of ULTRASONIC 3D STEREO WAVE PEST REPELLER allows waves be filled out of the protected area evenly and dynamically to achieve the best pest control effect. Most of dreadful pests and insects will be driven out from the area by this multi-directional stereo sound waves projecting pest deterrent. Thanks to the unique upper speaker, sound waves can be projected vertically and bounced off from ceiling freely. Plus the horizontal waves projection, the zero-dead-angle pest control can be achieved efficiently. The sound waves emitted from 3D STEREO WAVE PEST REPELLER strike the nervous and auditory systems of pests heavily. The irritated sound waves can force pests to give up the source of food, water and shelter. 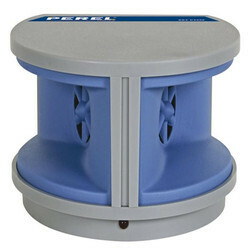 Equipped with an operation mode switch on the backside of the unit, 3D STEREO WAVE PEST REPELLER can be operated under MODE: OFF/ A / B / C. This unique design facilitates versatile pest repelling applications. Utmost effectiveness of pest control device can be obtained by setting the pest repellent to proper operation mode and randomly change it. Effective Range Up to 200 - 400 sq. ft.
Ultrasonic Pest Repeller LS-919 is a natural pest repeller using new electronics technology resulting from research into the life cycle of household pests to drive rodents and insects away electronically and intensively Scientific research has found ultrasonic sound waves attack the auditory and nervous systems of most common pests causing them pain and discomfort high sound pressure will chase mice cockroaches, fleas, ants and other common household pests away from their shelter. 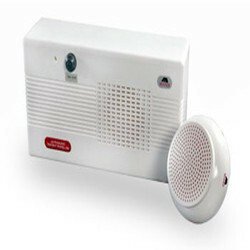 Ultrasonic Pest Repeller emits auto-changed and auto-sweeping frequency range of 21 KHz to 25 KHz from its speaker. This function is effective to drive pests away from the protection area quickly and to prevent pests from immunity to a pre-selected single sweeping rate. Ultrasonic Pest Repellent LS-968 is a stylish and effective rodent control device that provides intensive pest control effect. Ultrasonic pest repellent comes with a sturdy detachable bracket providing the possibility of of multi-angle adjustment when the device is mounted to a ceiling or to a wall. 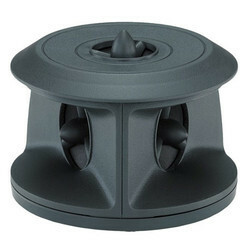 Simply placing the unit on the floor or shelf, the specially designed bracket makes it possible to point the Ultrasonic Pest Repellent downward or upward. Rat Repeller is basically a rodent repellent system, which is designed to remove away unwanted rats from protected places. Not only this, they are removed from anywhere inside the place where rodents are expected to intrude.Attack Wave Rat Repellent LS-927 is effective in controlling mice, rats, roaches, crickets and most of the other common pests. Attack Wave Rat Repellent is a device with auto-changed and auto-sweeping high intensity frequency range of 30,000Hz to 65,000Hz. The unique circuit design strikes the auditory and nervous systems of the rodents strongly with its intensive ultrasonic waves. This function is effective to prevent rats from immunity to a pre-selected single sweep rate. With 130 decibels of intense ultrasonic sound pressure, rats will give up their source of food, water and shelter and move on. 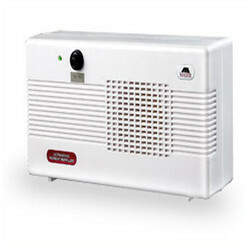 These high-intensity sound waves are out of the range of hearing of human beings and most household pets.If your business is related to food, and if you have not installed a rat repeller then you must install one soon to avoid hygiene risks.Prompt Pest Control is the most prominent pest control company in India, it is especially known for rodent repellent system that ensures the removal of rats and similar family members from the food area. 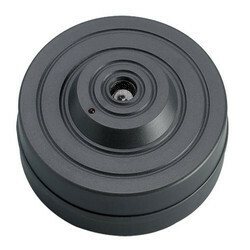 Effective Range Up to 3000 - 3200 sq. ft.
Ultrasonic Pest Repellent is a high-quality ultrasonic bird & rodent repellent system Pests are expelled by the direct simulation on their central nerves, through ultrasonic sound waves. The ultrasonic sound wave attacks the auditory and nervous system of pests causing pain and discomfort. Pests are impossible to stay.